Below is a list of Grade I and Grade II pipe bands in North Americacurrently, these bands are only found in the United States and Canada. Alberta Society of Pipers and Drummers (ASPD) No band listing page on their site, see results. British Columbia Pipers' Association (BC Pipers) Listing may be out of date. 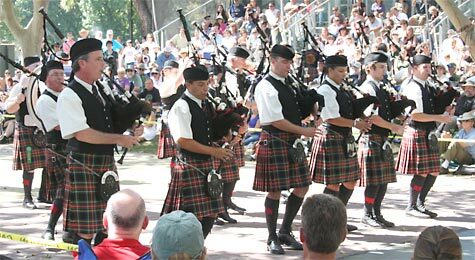 Pipers' & Pipe Band Society of Ontario (PPBSO) Band listing linked at left of PPBSO page. Southern United States Pipe Band Association (SUSPBA) Click on "member bands" at left. Listing is not always current. Please note that not all associations maintain their band lists with the same degree of vigilance! The list below was compiled after talking with bnad members of the various associations since some lists were either unavailable, unmaintained, or not updated to reflect new band gradings. In 2010, there were 11 Grade I bands and 18 Grade II bands in North America. In 2018, there were 5 Grade I bands and 27 Grade II bands in North America. The above list is believed to be accurate for the 2018 competition season. If you are aware of any changes, please contact me so I may update this page. This page last updated Monday, May 7, 2018. Page first created in November 29, 2009.